Lou Lou the lovely cat, showing the versatility of our suits! 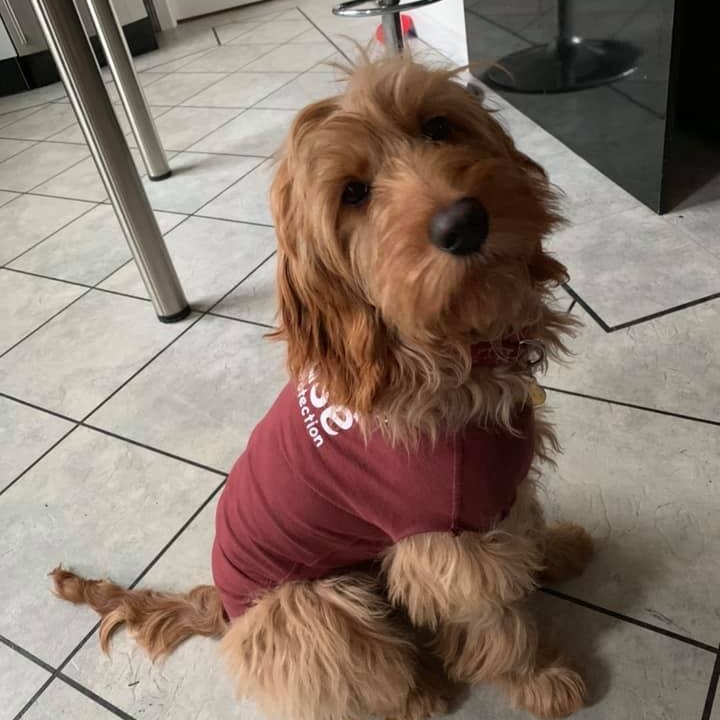 Charlie's owner chose the DogEase suit for him to recover in with maximised comfort after being neutered. The lovely soft Bamboo made sure the suit didn't interfere with his wound. This is lovely Dylan enjoying the comfort of a DogEase after being neutered. Even a lamb can make use of the DogEase suit. who knew!! Another great feature that customers have told us about is the suits ability to apply constant pressure that can offer a calming effect for dogs, almost offering the dog a "life like" hug. We call this the DogEase hug. There have been studies that have concluded that light pressure can offer a sense of comfort and reduce anxiety or nervousness that you may find some dogs may have. Our founders dog Isabelle would wear a suit when going on trips in the car to help reduce her anxiety levels to make the journey as pleasant as possible. Some owners have said they help with reducing the stress levels of their dog during fireworks. Further to this it has been noted it has helped some animals with seperation anxiety. Bentley Mac's Recovery from neutering with the DogEase suit. We all know about the cone of shame! And how funny it looks when a dog is wearing the lampshade after an operation, but the reality is having something put on their head that amplifies noise, restricts their vision, makes it difficult for them to eat and drink can all result in your dog becoming depressed and stressed. I certainly would not want to wear one. Bentley Mac is a one year old, miniature schnauzer from Belfast. He is a very lively young man who lives in boisterous household and is very active so there is no way a cone was going to work. After the operation the vet put Bentley's suit on while he was asleep, but when we got home we discovered the clinic had forgotten to cut a whole out for him to be able to pee. As all boys anatomy is not the same a hole needs to be created in the suit to allow boys to pee through and the bamboo material is perfect for this as it does not fray. For Bentley, coming around after the operation and adjusting to having no ‘bits’ took a few hours of funny walking. For the first couple of hours Bentley adjusted to the suit, we had to ease him into the notion of no bits and the wearing of the suit taking it off around the back for a short time and keeping a constant eye on him until he got used to wearing it. Bentley is a sensitive soul. As well as Bentley being restricted from licking the wound the suit also protected the wound against rubbing on the floor when he was laying down and picking up daily dirt. For the next few days Bentley settled down and was much happier. We kept a very close eye on him to ensure he was not up to any mischief. The tight fitting suit on the pressure of the dog acts as hugging mechanism making the dog feel more relaxed and calm. Like he was getting a hug all day and we all love some TLC after a big operation. Over the course of the 10 days, monitoring Bentleys recovery was made easy by being able to slide the suit across gently and check his stitches with ease. It was a relief to see him happy and still be able to be his usual active self even after having gone through his op. On the 10th day, the vet was delighted with his recovery and the suit came off. As you can see below, Bentley was very comfy! Levi and Louis were in last month getting neutered. They are both rocking our very fashionable #dogease suits which are an alternative to the buster cones. The Dogease suits are very soft as they are made from bamboo and help with wound healing. Don't these cuties look fab? Willow Vets love DogEase- this puss has had a little nibble on its suit! Thanks to Willows vet group at the Wirral Branch for their fantastic review. #TeamAcorn #AcornVeterinaryCentre #WillowsVetGroup #WVG #Cheshire"
DogEase suit continuing to make life easier. These suits are literally the answer to mine and my dogs prayers. After a really rough 3 surgeries on a mass cell tumour on my dogs leg , bandaging just wasn't working on its own. Teamed with the DogEase suit really was the most comfortable and easiest way to treat the open wound , which is allowing it to heal in the best & quickest way possible. Thank you !! Our dog Maximus has a large open wound following a dog bite. After a while our vets sent him home in a suit. It covered the wound but didn't fit great. We wanted a spare so ordered a DogEase suit which has been our favourite ever since. It arrived quickly and despite looking small fits perfectly due to the stretch in the fabric. The close fit is comforting to Max and it also holds a dressing in place if necessary. What's even better is Max can go to the toilet without any owner intervention! In our case we still have to use a cone when Max is alone due to the location of his injury, but that's not an issue for us. We would definitely recommend this product. For those unsure what size we went by weight (Medium) for our long and slender Sheltie. Thanks! Just love this wonderful product!! My little foxie has been itchy for ten years and I had been looking for something like this to use on her, as drugs were just not an option due to horrendous side effects and lack of efficacy. I happened to see a little dog on Facebook here in Australia on a veterinary practice page with a DogEase coat on and knew I had to have one for my girl. After contacting them I had her coat in a matter of days and it began immediately to make her life so much more comfortable. Would HIGHLY recommend!! A brilliant idea! Our 6 month old Springer Nuala hates crating or being restrained so we knew we would have problems getting her to wear the cone of shame after spaying. 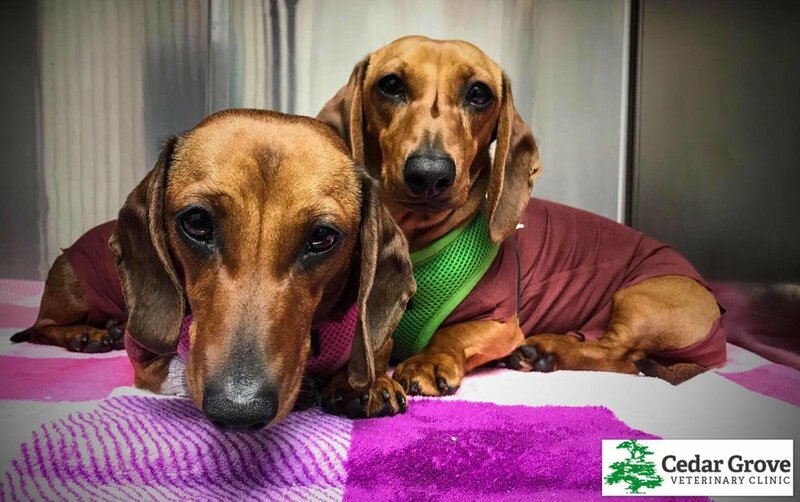 While booking her in at our vets, I noticed one of the receptionists dogs wearing a Dogease shirt after surgery and learned all about them. I ordered one straight away and it's been a godsend. Nuala is a typical Springer and doesn't know how to relax! The Dogease coat has kept the wound clean and protected and even though I've caught her licking at the material, she hasn't been able to get at the stitches. She is able to toilet easily without having to remove the coat and doesn't seem to notice she is wearing it. We would definitely use Dogease again if needed.